WHO IS BUYING THE BUSINESSES IN TOWN? AND WHERE THEY ARE COMING FROM? 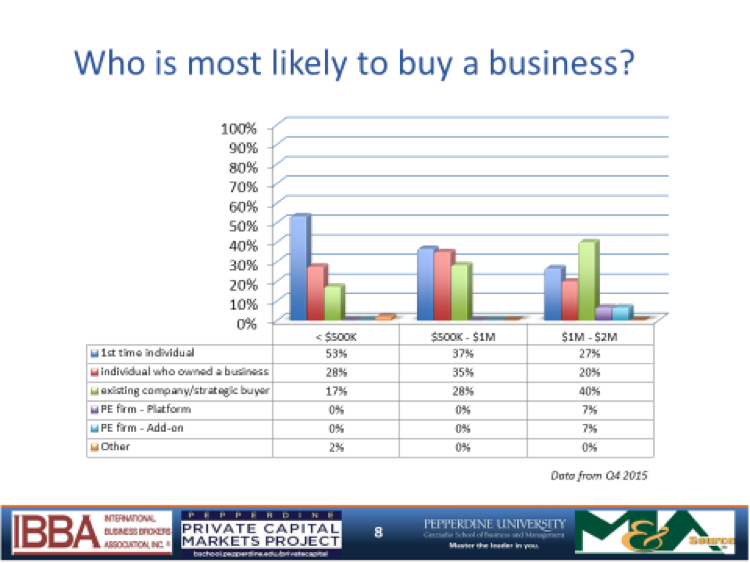 According to the most recent IBBA and M&A Source Market Pulse Survey Report, ‘individual’ buyers still hold a small lead in acquiring businesses under $2 million in value. The buyers of smaller businesses are most often located within 20 miles of the company. Many owners do not realize this and often have the assumption that the buyer will come from outside of their community. Multiples did not significantly change compared to the 4th quarter of 2014. ‘Time to close’ increased by 3 months for businesses with $2 million or less in value, reflecting the current market demands and activity. ‘Retirement’ continues to dominate as the number one reason for selling.